how is Laplacian filter calculated? I don't really follow how they came up with the derivative equation. Could somebody please explain in some details or even a link to somewhere with sufficient math explanation? Monsieur Laplace came up with this equation. This is simply the definition of the Laplace operator: the sum of second order derivatives (you can also see it as the trace of the Hessian matrix). 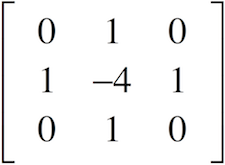 Because each derivative introduces a half-pixel shift, the 2nd order derivative ends up with a 1-pixel shift. So we can shift the output left by one pixel, leading to no bias. This leads to the sequence f(x+1)-2*f(x)+f(x-1). Computing this 2nd order derivative is the same as convolving with a filter [1,-2,1]. Not the answer you're looking for? Browse other questions tagged image-processing filtering convolution derivative or ask your own question. Laplacian of Gaussian in openCV, how to find zero crossings? Is Laplacian of Gaussian for blob detection or for edge detection?